Please read through these carefully – it might save you a wasted application! I need accommodation. Do you offer ‘live in’ jobs? Sorry, no. You need to arrange your own accommodation. Generally, applying from outwith the area, with no immediate knowledge of the area, will mean that we cannot consider your application until you have secured accommodation. Try Clachaig Inn, Glencoe for live in positions. I need confirmation of employment before I can apply for a work visa. Will you offer me a job so that I can do this? No, we can only consider applications from ‘work legal’ applicants. We do not involve ourselves in visa applications. I haven’t really worked in a bar or restaurant before and am concerned that a lack of previous experience will mean that I’m not considered for a job. Unlike rocket science, looking after customers’ requirements can easily be picked up by anyone with some energy, enthusiasm and at least a modest amount of common sense. Demonstrate that you have these and you’ll rank as well as someone with previous experience. I quite fancy working in the catering side of the business but haven’t any previous experience. Should I apply? Yes, we’re always interested in training enthusiastic staff with new skills, particularly food preparation. Our in house training in the kitchen is structured to start from the very beginning, regardless of experience. I’d love to spend my time climbing, hiking, canoeing and doing as much as possible. Getting a job in Fort William will give me a great base to do all this from. Will I be able to get some extra time off if the conditions are good? Don’t bother applying. Unless you’re committed to the idea of a job and all that it entails you’re not going to be a valuable member of the team. If I get a job in Fort William I’d love to be able to see more of the Highlands, maybe get some climbing and hiking done, but I’m worried about being tied by the job. Should I apply? By all means! We’re the first to accept that there’s more to life than work. We try and ensure that you have 2 clear days off every week and always guarantee 1. Though we can’t organise the weather for you there’s plenty of opportunity to get the most from this great corner of the world. Work hard and play hard! I’m not too sure about travelling to and living in a new area on my own. Who will I be working and living with? The Grog & Gruel has a staff of up to 15 for much of the season, and even at the quietest time there’s always a good number around. It’s an ideal opportunity to meet and work with many young like-minded people with similar interests. 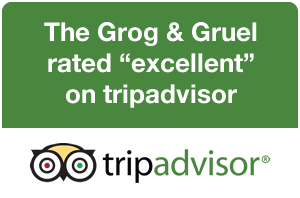 Friendships made at The Grog & Gruel last for years as our alumni will testify. There are some unscrupulous employers out there. How can I be sure you’re not one of them? All staff are provided with and asked to sign a written contract of employment which clearly spells out contractual obligations of both parties. In addition, since we are recognised as meeting the national Investors in People standard you can be assured that we follow principles of good practice when it comes to inducting, training, coaching and even disciplining members of staff. Do you provide a uniform? Our front line staff are expected to wear either a staff t-shirt or a branded gilet jacket when on duty. These are provided on a deposit rental agreement. Return them in good condition at the end of your employment and it will cost you nothing. Similarly, our kitchen staff are provided with whites and it is the individuals responsibility to keep these clean. I have 4 weeks during which time I would like to work. Do you employ people for this period of time? Generally, no! Training and familiarisation is an important of being able to perform to the appropriate standards and this process can take several weeks. Even with previous experience elsewhere in the industry, it will take some time to become familiar with the way The Grog & Gruel works. We are prepared to invest a lot of our time in you to bring you up to our standards, but we require a commitment of approximately 3 months to make this a worthwhile investment. The only exception is usually during peak holiday periods such as New Year, Easter and Whit, when we hope you’ll use the week or so as an introduction for a longer period of work later in the (summer) season. I understand English but I need more practice before I can say that I am a fluent English speaker. Will working at The Grog & Gruel allow me to develop my language skills? You need to be able to communicate confidently in English as there are many work situations were there is pressure to work quickly and efficiently (a busy night in the bars for one), sometimes dealing with either strong regional accents (try Glaswegian for a start) or foreign accents. Please don’t apply if you’re spoken English is not of a high standard. I’ve been offered a job at The Grog & Gruel. What paperwork do I need to bring with me? We require a signed application form, a C.V. and your National Insurance number. If you have had another job in the same tax year you will need to provide a P45 from that job. Alternatively, you will have to sign a P46, which we can provide. If you are travelling from abroad, we will also require sight of your BUNAC forms, and a copy of your work eligibility visa stamped in your passport.